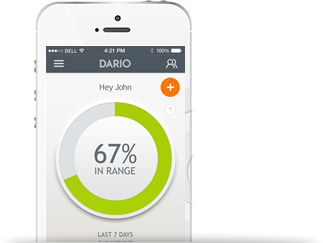 The Dario mobile app is a complete, cloud-based solution aims to simplify your diabetes management. It gives you real-time tools and actionable information that makes it easy to track and better understand your glucose levels and making it simple to share your personal health information with loved ones and health care professionals. Real-time, easily accessible information – all your data ready and waiting at your fingertips. Your blood glucose level results are automatically logged and synced to the app, no more need to write in paper log books. Data insights, analysis and pattern recognition – understand the trends of your blood glucose levels. Carb Counting Tool – our food database contains nearly 500,000 food items, helps you to remove the guesswork from carb counting by doing the math for you. On Demand Sharing – Dario app can seamlessly share real-time information with loved ones and healthcare team. Emergency Hypo Alerts with GPS Locator. Simply connect the Dario™ Blood Glucose Monitoring System to your smartphone or tablet, launch the device and app, and your blood glucose readings will be automatically transferred to the app. All your recorded data, such as blood glucose data, carbs & insulin intake, physical activity as well as your tags & notes, are presented in the “Logbook.” You can view all your information as a chronological list, a graph, or compare different time segments, edit your data and share it with your caregiver and loved ones. One of the key features on the Dario App is the insulin calculator, that helps you estimate and adjust your suggested insulin dosage according to your carb intake, blood sugar level and desired sugar level. Your own personal dashboard is showing your blood glucose data and helping you with understanding the impact behind the numbers. The statistics screen presents you with a breakdown of all your measurements so you can easily identify trends, monitor your averages and even estimate your A1C to keep you on track. This helps you to proactively simplify your diabetes management, on the go. Your data is constantly synced and available in one cloud-based app that stays with you wherever you are, giving you complete control of your data. Not only do you have access to data, you can share critical data (such as hypo alerts) in real-time with your loved ones, caregivers and physician.